"Stay Calm and Stitch" was the final of three topics during a day-long advanced skills workshop held for nurse practitioner students at the Decker School of Nursing on Jan. 26. Image Credit: Jonathan Cohen. 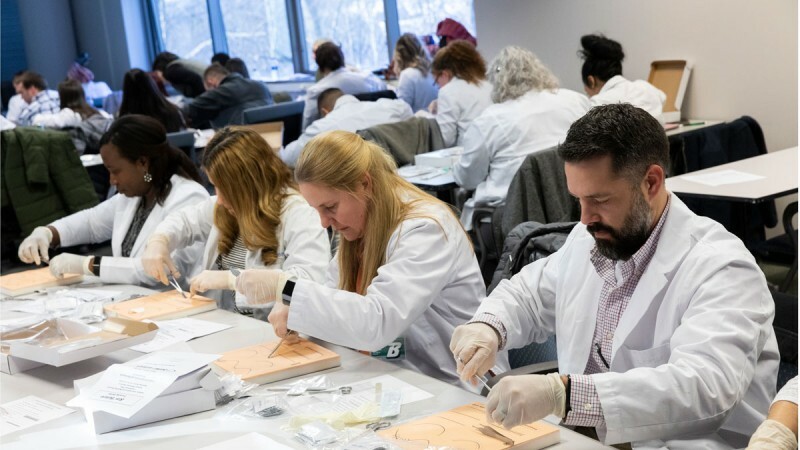 "Stay Calm and Stitch" was the final of three topics during a day-long advanced skills workshop held for nurse practitioner students at the Decker School of Nursing on Jan. 26. Photography: Jonathan Cohen. 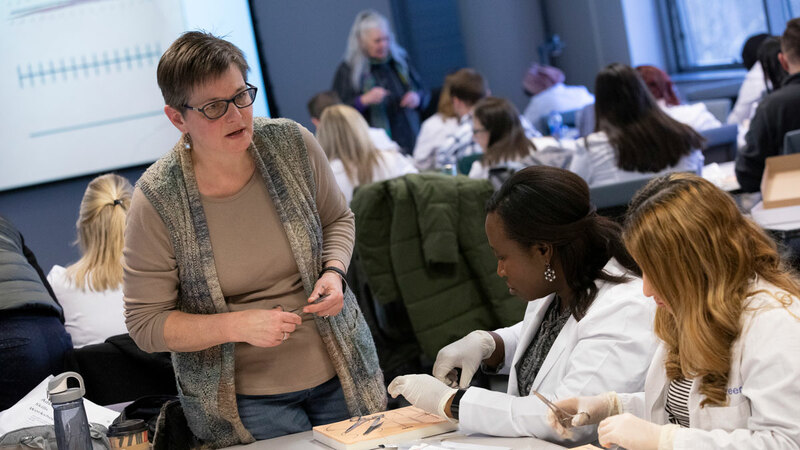 Binghamton University’s Decker School of Nursing (DSON) held an Advanced Skills Workshop Jan. 26 for students in the master of science program pursuing certification as family nurse practitioners. The program included sessions on reading X-ray images, interpreting electrocardiograms (ECGs) and suturing. Fifty students attended the day-long training, a mandatory component of NURS 555: Functional Role III Nurse Practitioner. Stephen Gomez, MD, director of emergency medicine at UHS Wilson Medical Center in Johnson City, N.Y., presented the opening session, “X-rays: Seeing Life in Black and White.” Gomez has been working in the field for more than 30 years and sharing his expertise with Decker students for a decade. Decker faculty members Tamara Burger (front) and Kathleen Anderson were on-hand during the suturing practice session to help students learn proper technique. Image Credit: Jonathan Cohen. Finally, Gomez advised students to develop a comprehensive technique for reading X-ray images and then always follow that technique. Kristen Lewis, MS ’99, a nurse practitioner with the UHS Heart & Vascular Institute in Johnson City and a presenter at the annual workshops for several years, was the second speaker. She presented “12-Lead ECG Interpretation,” which included information on proper lead placement and how to read ECG waves and interval patterns. Graduate students in the Decker School completed 868 hours of simulation and practice in 2018. Here, nurse practitioner students practice suturing as part of the Advanced Skills Workshop. Image Credit: Jonathan Cohen. The final topic, “Keep Calm and Stitch,” was presented by Cynthia Durham, a nurse practitioner with Crouse Hospital in Syracuse, N.Y., who is also a regular presenter at the skills workshops. Her lecture provided comprehensive training on wound evaluation and healing, local anesthesia selection and delivery, instrument choice, suture selection and how to prepare a wound for sutures. 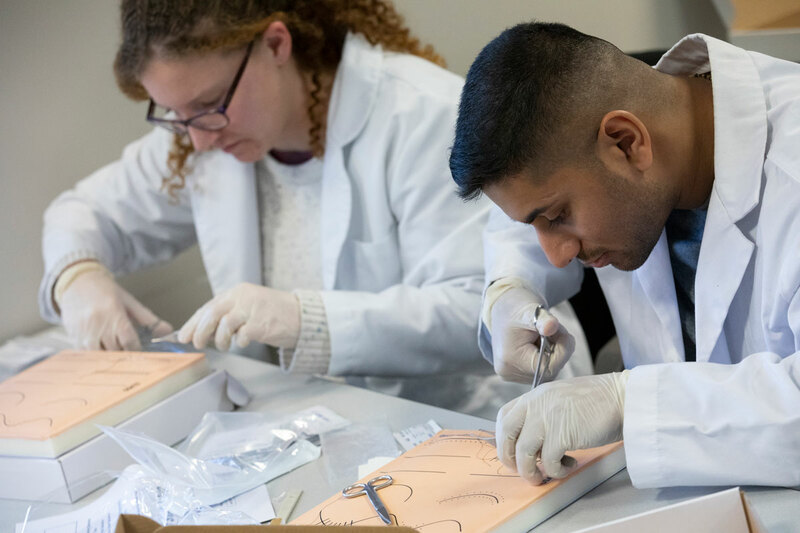 During the hands-on portion of the suturing session, Durham demonstrated simple interrupted, vertical mattress and subcuticular sutures before the students practiced the sutures on foam. Durham and three other nurse practitioners moved throughout the room assisting students, answering questions and checking to ensure students learned proper techniques. Those helping students were Decker faculty members Kathleen Anderson, DNP ’12, clinical associate professor, and Tamara Burger ’97, clinical instructor; and Deborah Schu of I.A. Tangoren Dermatology in Syracuse. Our annual skills workshop was an overwhelmingly positive learning experience for our students, who will soon be graduate nurse practitioners in our community. During lunch, which was provided by Decker’s Graduate Student Nursing Organization, recruiters from four area healthcare organizations made brief presentations. Students then had the opportunity to visit with the recruiters one-on-one. Recruiters attended from Bassett Medical Center in Cooperstown, N.Y.; Guthrie Medical Group in Sayre, Pa.; Our Lady of Lourdes Memorial Hospital in Binghamton, N.Y.; and UHS Hospitals in Johnson City. Among the recruiting team were Decker alumni Kelly (Swartz) Wilmarth ’09, MS ’14, and Michael Reistetter, MS ’18; as well as College of Community and Public Affairs alumna Kerry (Ferguson) Hitchcock ’07.